One of my most favorite activities to do in Jakarta is Car Free Day. Every Sunday, the usually jam packed Jl. 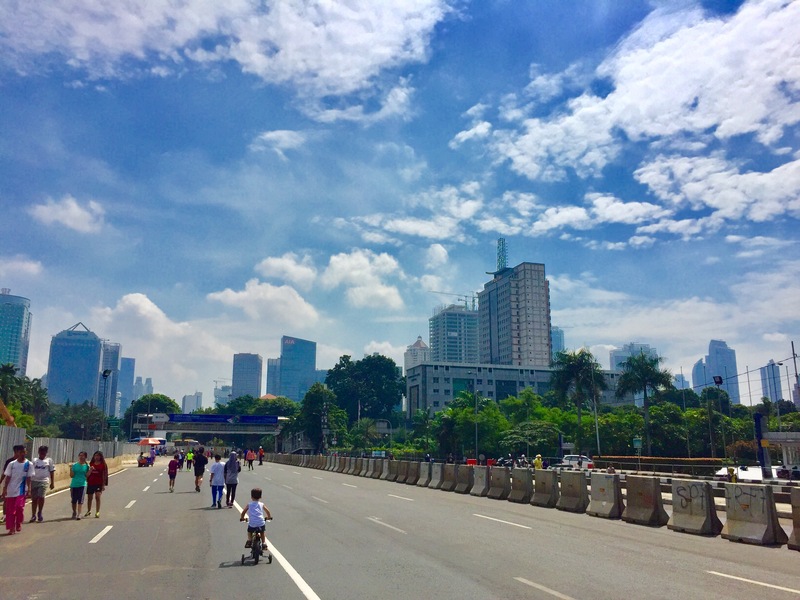 Sudirman, which is the main arterial road through Jakarta, is closed off to all motorized vehicles (except the big public buses in the dedicated bus lane) from entering between 6am-11am. The city suddenly becomes tiny to me and as I walk or ride my bike down Sudirman, I realize how close everything is without traffic! It’s refreshing to be able to walk on the street and see the city from a different vantage point. The vibe is always upbeat and everyone is festive. There are dance parties, protesters, marathons, dancers practicing their routines, buskers, young school kids doing karate, dogs and their owners (being walked by their dog nannies), blind singers, young teenage boys on skateboards doing tricks, electronic cars driven by 2 year olds, monkeys in costume, snakes in hats, a little 4 year old Houdini kid in chains, street market and vendors and other random sightings that makes Jakarta what it is…an eclectic mix of people and cultures. Everyone and everything is welcome here and that’s what I love about this city. Nothing is strange or out of place. Please tell share the random and funny things that you have seen on Car Free Day?